In Russia, the New Year holiday trumps even Christmas in importance, and major celebrations take place all over the country in recognition of the holiday, but there is also a second New Year recognized in Russia, the Old New Year, which takes place halfway through January and denotes the new year in the old Orthodox Calendar. Russians welcome the New Year by saying “S Novim Godom!” (С Новым годом! ), so if you're planning a vacation to Russia this time of the year, be prepared to say this a lot while you're going between unlimited festivities to celebrate the past year and ring in the new, anytime between December 30 and January 15th. Whether you're in Moscow or Saint Petersburg, there's sure to be a variety of great activities to help you celebrate the changing of years. Read on to discover more about the customs, traditions, and celebrations of this annual holiday in Russia. If you're in Moscow, you can head to Red Square to experience the most popular public New Year celebrations, but you can just as easily avoid the crush of people on the square by attending a private party that serves traditional Russian food. The host for Russian New Years' celebrations may set up a zakuska table for guests, which will be covered with little bite-sized snacks that go well with drinks—think caviar and dark bread, pickles, and marinated mushrooms. So if you don't have any Russian friends, make some and join their zakuska tables to get the most out of your Russian New Year celebration! 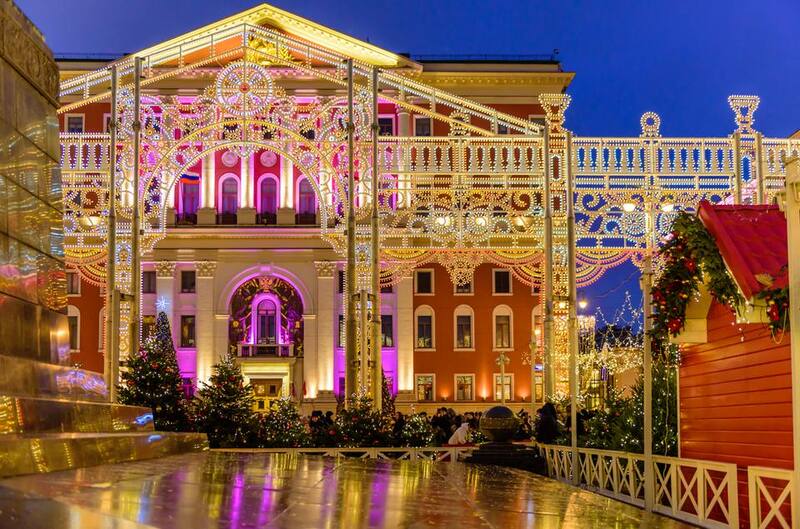 Other cities throughout Russia will also have their own fireworks displays or concerts to mark the change from the old year to the new, so be sure to check events calendars for outdoor locations or exclusive parties in whichever city you plan on visiting before you embark on your trip. The most extensive New Year celebrations in Russia occur on December 31st to January 1st, like most of the rest of the world, where fireworks and concerts mark off this special holiday, and it is also on this day that the Russian Santa, or Ded Moroz, and his female companion Sengurochka visit children to pass out gifts. What those in the West would call a Christmas Tree is considered a New Year's Tree in Russia, and because the Russian New Year precedes Christmas in Russia (which takes place on January 7), this tree is left up in honor of both holidays. This New Year is considered the “New” New Year because it was first recognized after Russia made the switch from the Julian calendar (still recognized by the Orthodox Church) to the Gregorian calendar which is followed by the Western World. During the Soviet period, the New Year was celebrated in place of Christmas, though Christmas has been regaining importance as a holiday once again. Russians have a second opportunity to celebrate the New Year, which falls on January 14th according to the old Orthodox calendar. This “Old New Year” (Старый Новый год) is spent with family and is generally quieter than the New Year celebrated on January 1st. Folk traditions, like the singing of carols and the telling of fortunes, may be observed during Russia's Old New Year, and a large meal will be served.